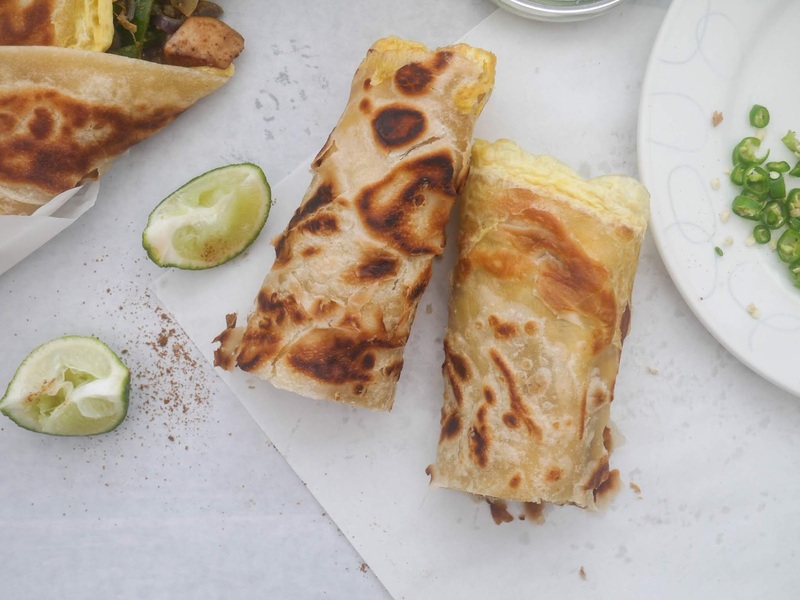 This Muslim Girl Bakes: Smoky Chicken Paratha Rolls. Guys! How are you? It has been a while since we last spoke. I hope you'll forgive me because to make up for it, I'm sharing a pretty good recipe with you all today. Say hello to these smoky chicken paratha rolls. 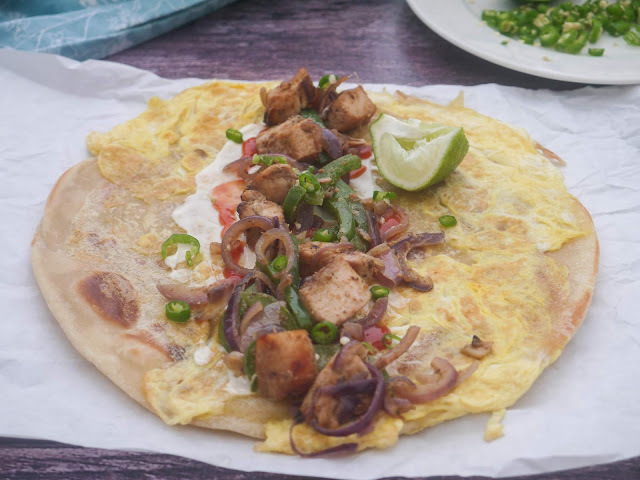 I've shared a version of them before way back in 2013 but this time, we're kicking things up a notch with homemade flaky parathas and our new favourite smoky chicken. That's right. After what feels like forever, I'm showing you how to make flaky parathas from scratch. Yes, you can buy them but nothing beats homemade. 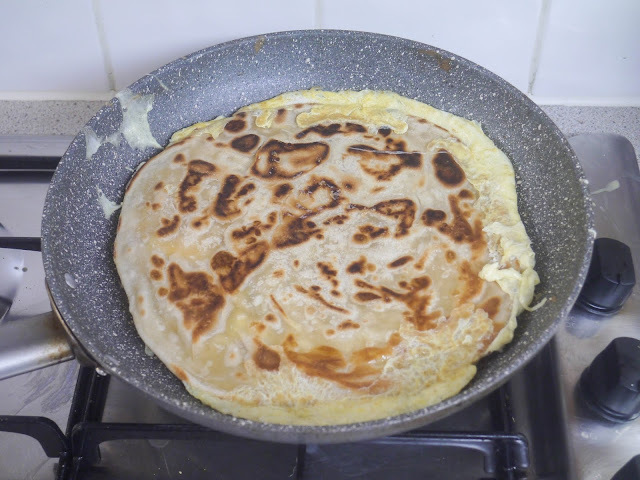 They have been a constant recipe request from you guys for ages but I was always put off the idea because I thought they were time-consuming and hey, don't even the supermarkets sell frozen parathas these days? But after a few not-so-tasty frozen parathas and a trip down mooli paratha lane, I decided to give flaky parathas a go at home. And guys, they were pretty epic. The parathas start as do all good flatbreads, with a good dough. Smooth and soft is what we are looking for in our dough today - I find a good knead for a few minutes especially in the stand mixer does the job. 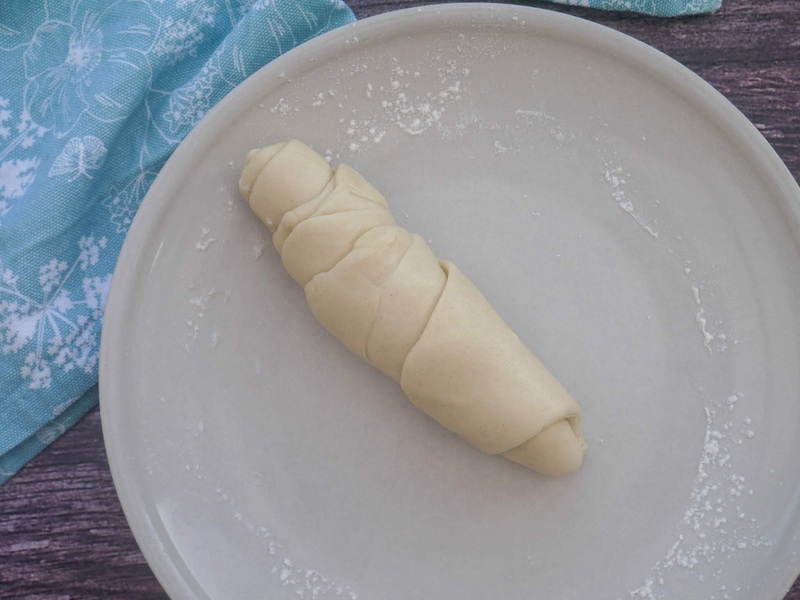 Once the dough has rested, we divide it up and slip in a knob of butter for extra flaky layers. Then the real layer building begins. 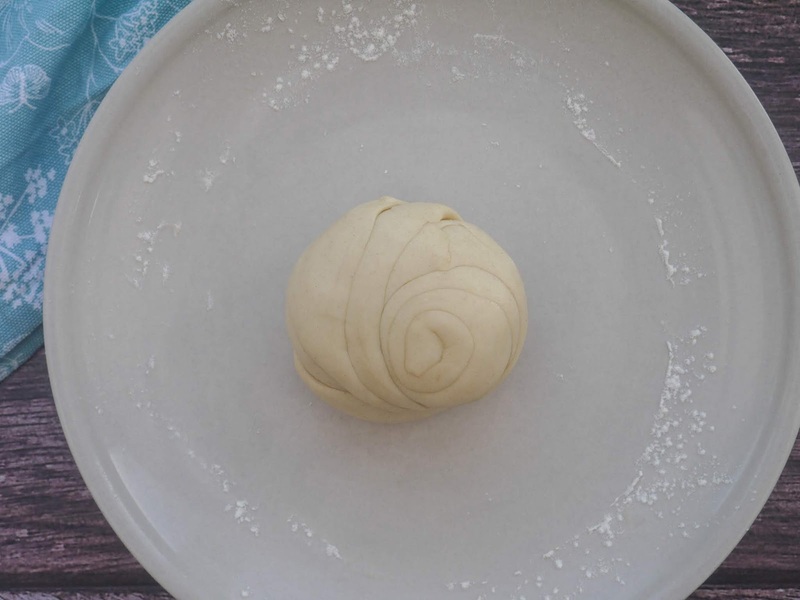 It involves flour, oil and plenty of swirl-making on your part. Sounds complicated but scroll down for the step-by-step photos and you'll see that it really isn't. Our dough swirls rest until you're ready (don't you love a recipe that is ready when you are?) and then it's time to cook. 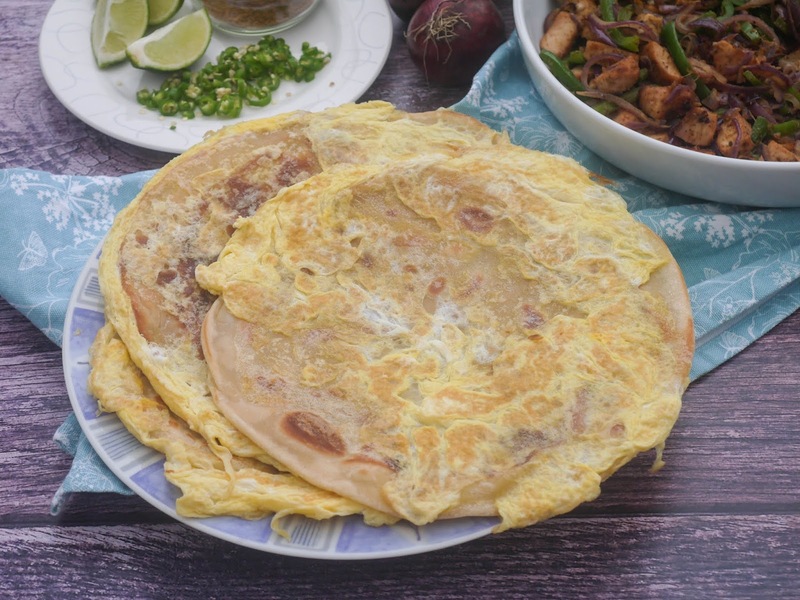 Fry them until golden brown and crispy, pouring over a beaten egg if it's an egg paratha you're in the mood for. Again, the pictures will tell the story better than any of my words. 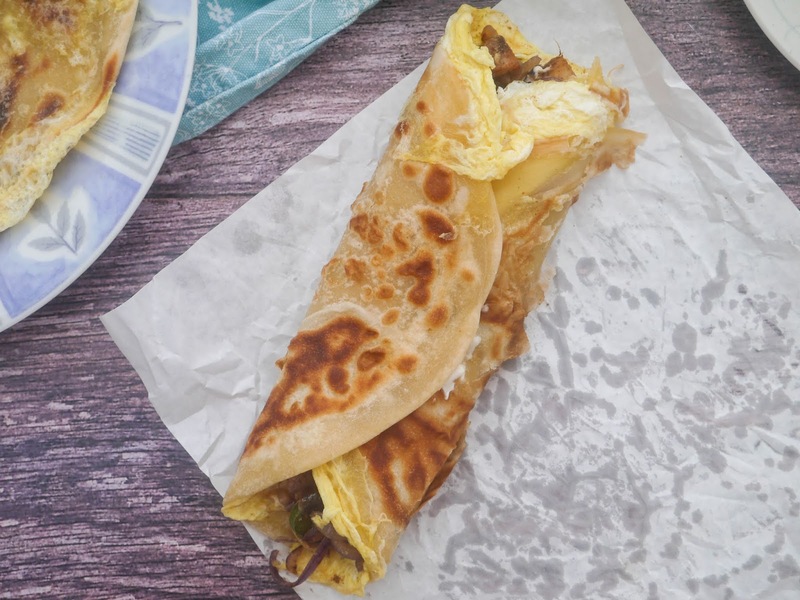 The parathas are delicious with whatever you want to eat them. 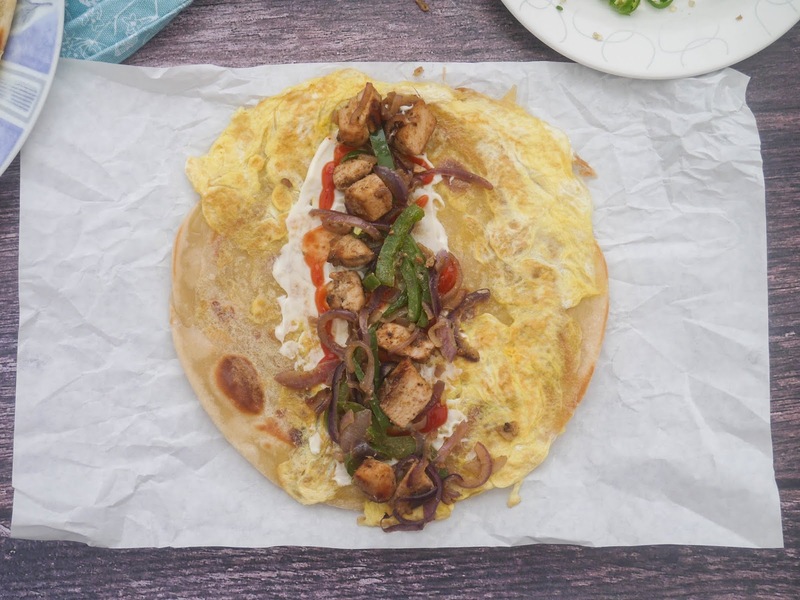 We are particularly taken with using them to wrap up smoky chicken, peppers and onions. 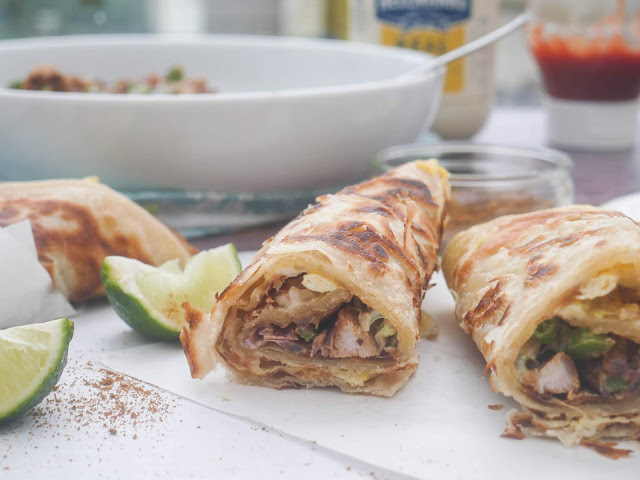 To bring the wraps to life, add in plenty of sliced green chillies, chaat masala, and lime juice for extra zing. 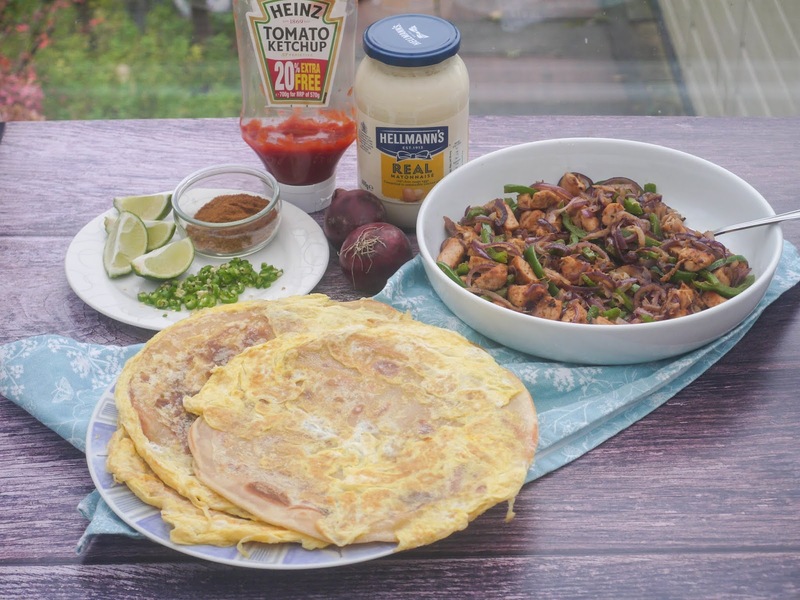 Delicious for the weekend! 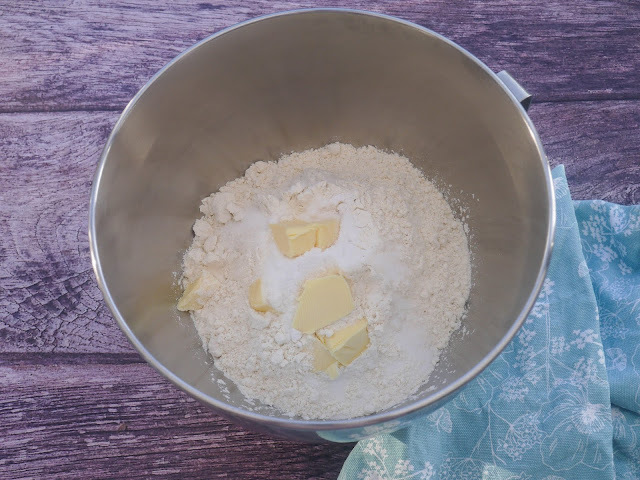 Mix the flour until the butter is well combined and the mixture resembles breadcrumbs. 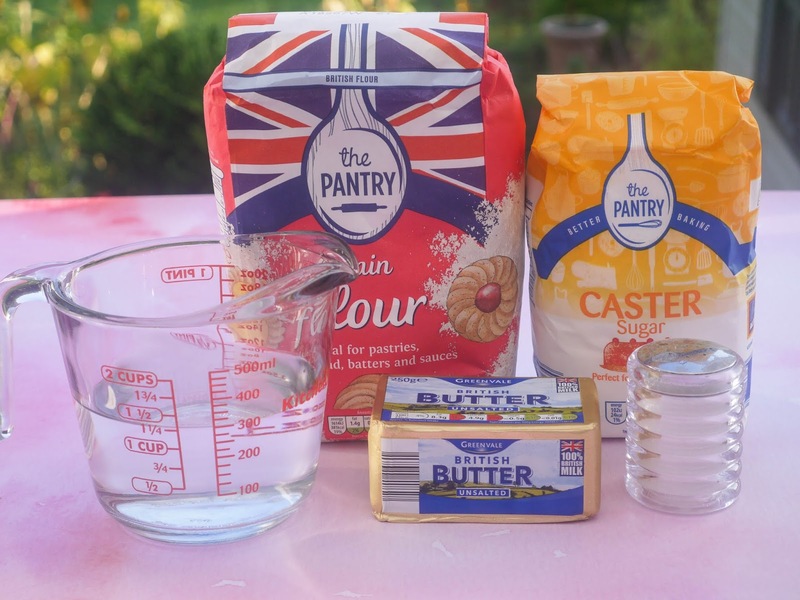 Gradually pour in 300ml Warm Water and mix until you have a dough. You may not need all the water. ... the dough is smooth and soft. 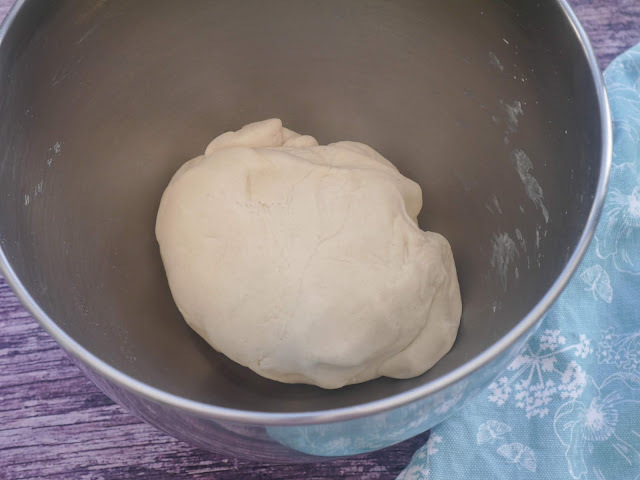 Put the dough into a lightly oiled bowl and rest for 1 hour. 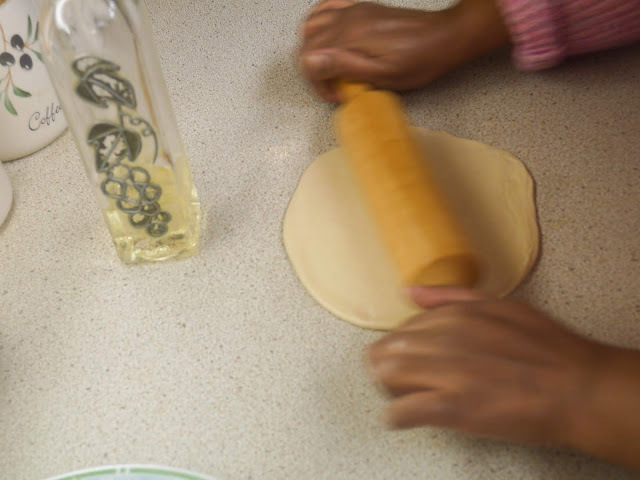 Then, divide the dough into 6 pieces. 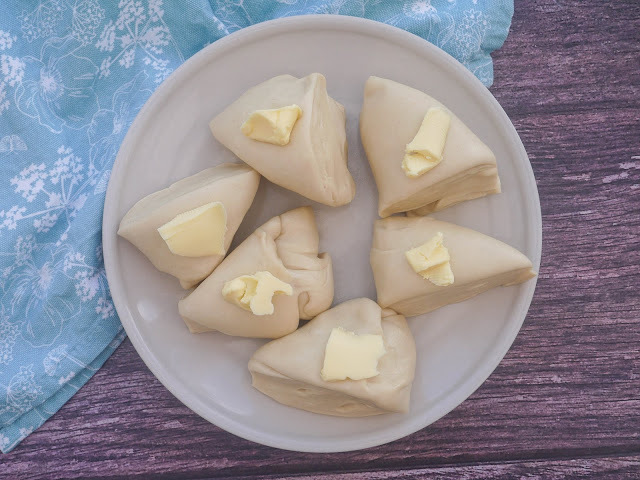 Place a dollop of Butter onto each dough piece. Next, let's create layers in our paratha. To do this roll each ball into a small circle. 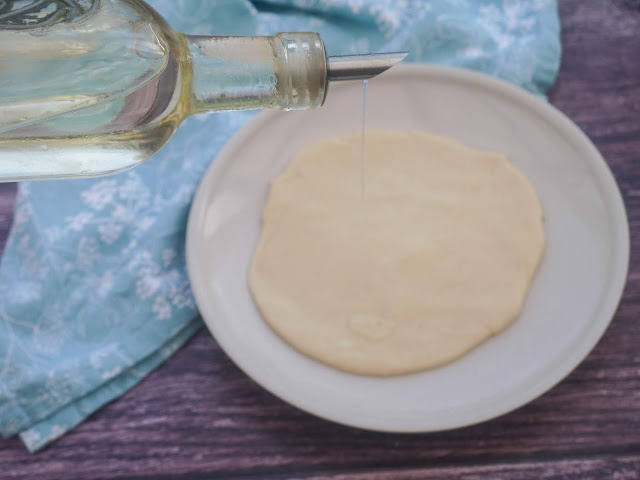 Brush the circle with Vegetable Oil. 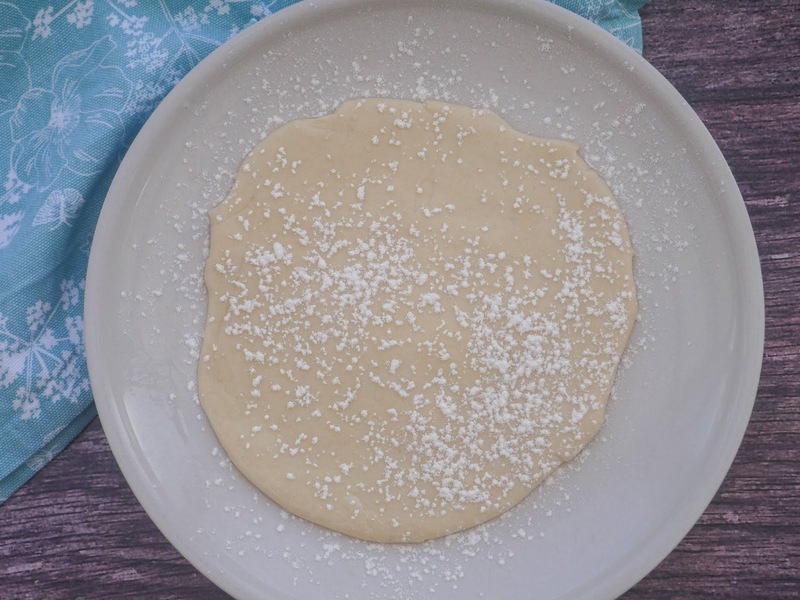 And, sprinkle over Plain Flour. And, roll up into a cone. Finish by using the palm of your hand to flatten the cone down. 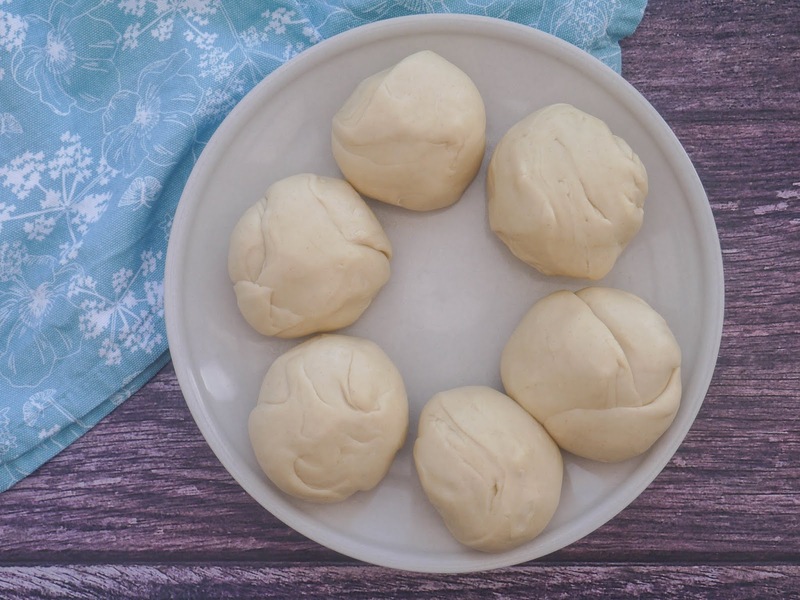 Do the same thing with the remaining dough balls. 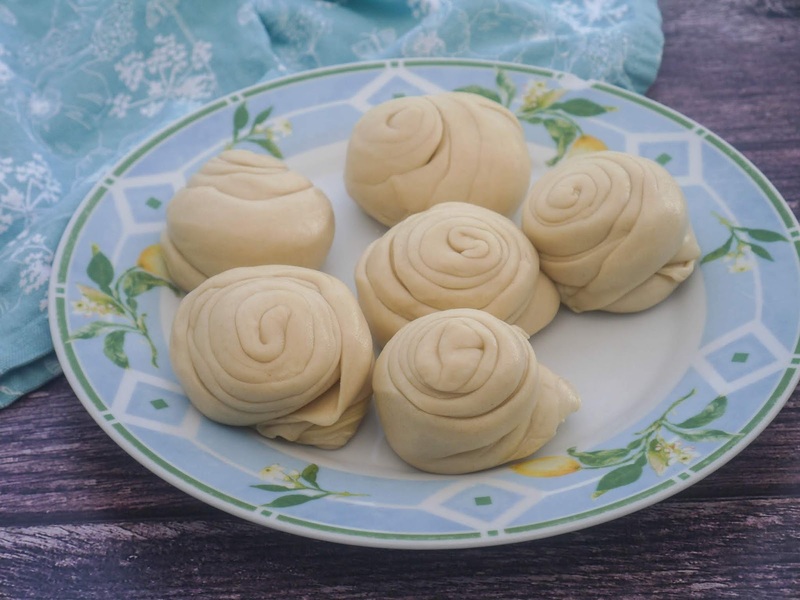 Let them rest for 15 minutes or overnight in the fridge. I've tried both ways and prefer the overnight result. Next, let's marinade and smoke the chicken. I usually smoke chicken once it's cooked but this time did it when the chicken was raw. 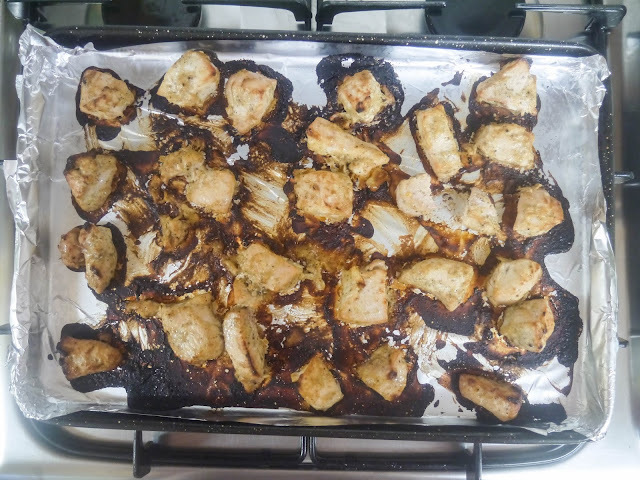 We definitely found that this gave the chicken a more smoky flavour. Heat a piece of BBQ coal over a gas flame, turning every now and then until the coal is white. This can take around 10-15 minutes depending on how big your coal piece is. I like to get it going now! 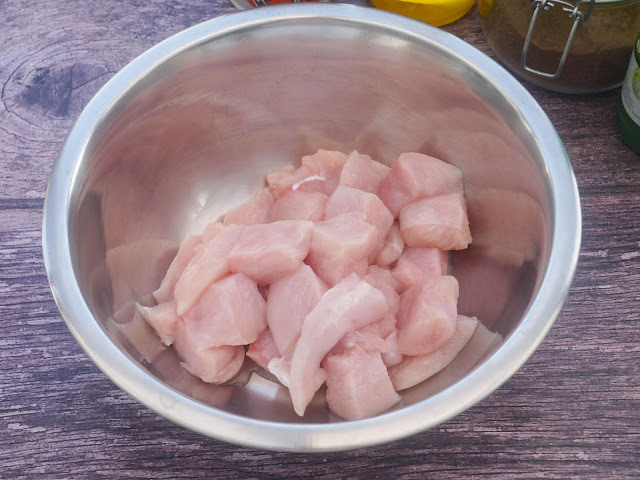 For the chicken, I used 500g Boneless Chicken Breast Pieces. Thigh pieces would also be delicious and much juicier. 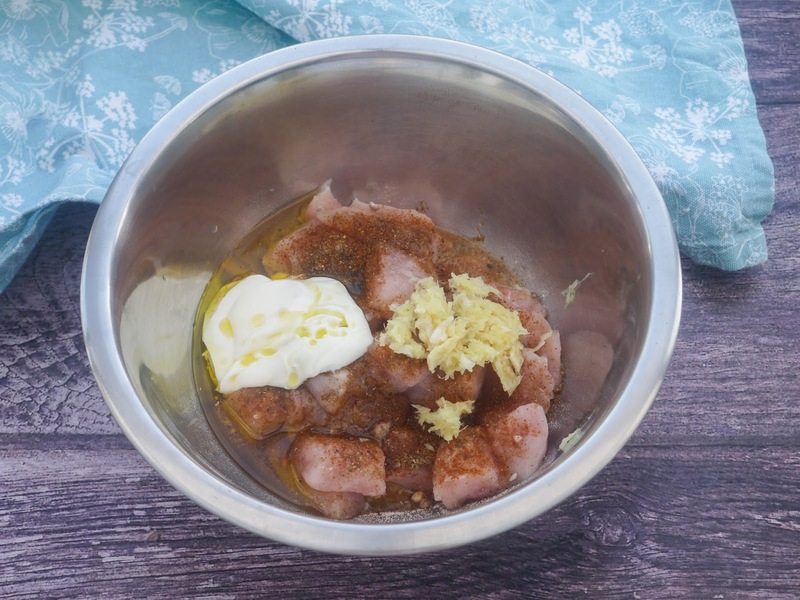 The marinade ingredients are pretty simple. 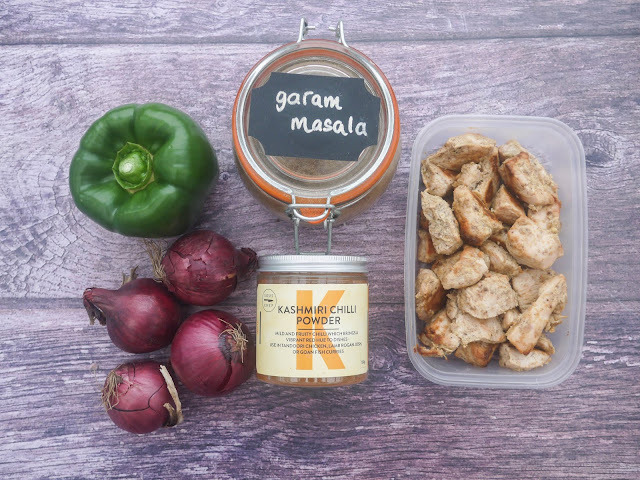 The only one that is a little different is black salt (kala namak). 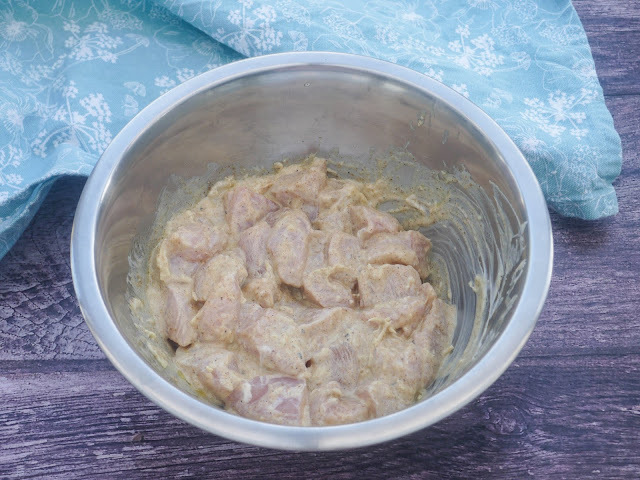 It doesn't smell the best but gives a really distinct flavour to the chicken. Place a piece of foil in the middle of the bowl and put the hot coal on top. 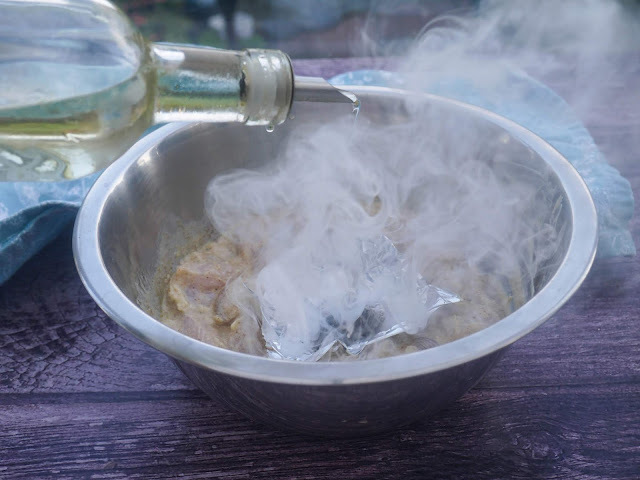 Drizzle 1 tablespoon Vegetable Oil over the hot coal. It will smoke immediately. 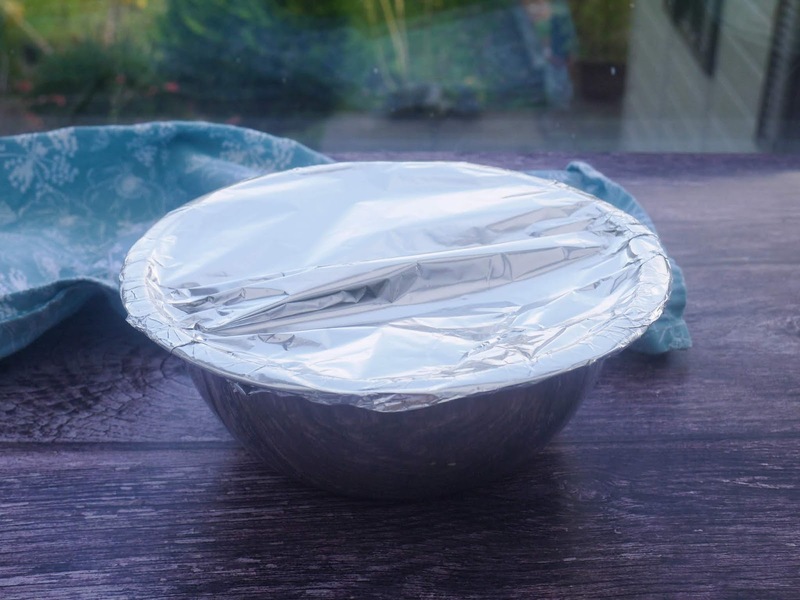 Cover the bowl straight away with a piece of foil to trap all the smoke. 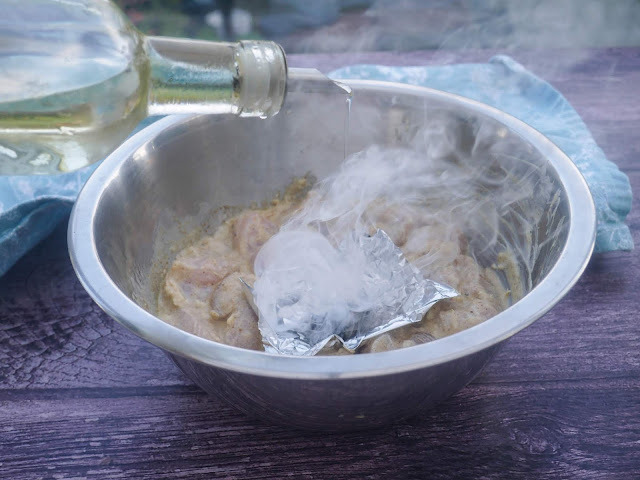 Let it sit for 5-10 minutes depending on how smoky you want your chicken to be. Uncover and remove the foil and coal. Cover the chicken and leave to marinate for 1 hour. When you're ready to cook, bake the chicken on a foil-lined tray for 15 minutes at Gas Mark 9 or 220C. I have tried cooking the chicken on skewers which can help it stay more juicy. The choice is yours! The chicken is done! 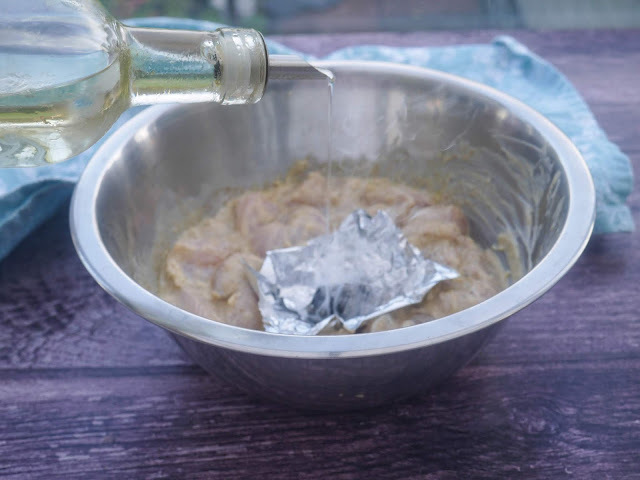 And, I was so glad that I lined the tray with foil! 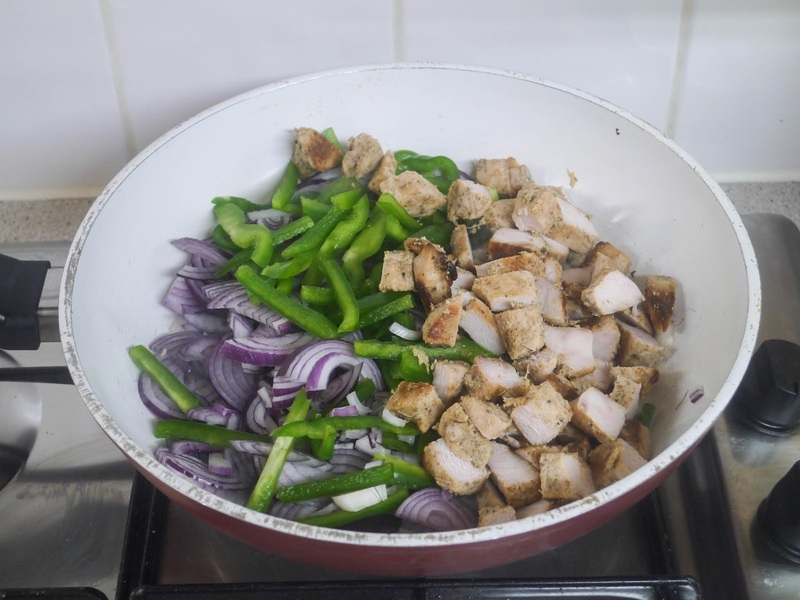 Next, we are going to stir-fry the chicken with peppers and onions. 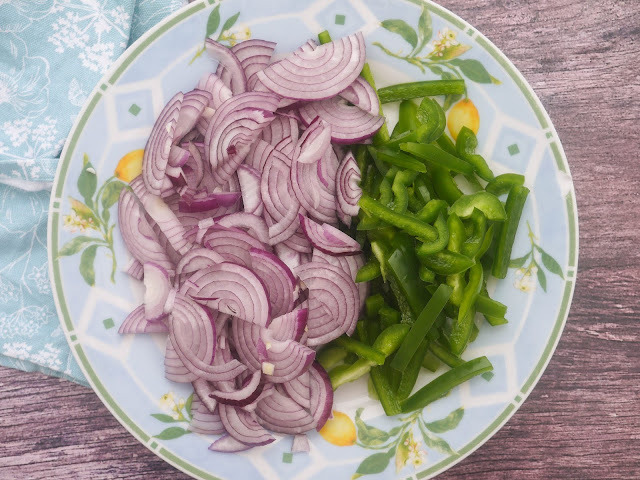 Peel and thinly slice 4 small Red Onions. Thinly slice 1 Green Bell Pepper. 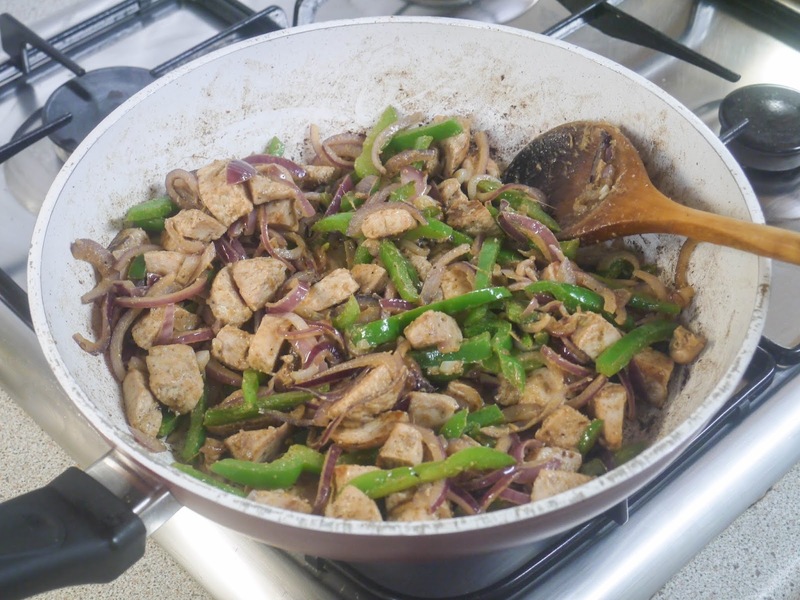 Stir fry the chicken for 4 minutes over a high heat. 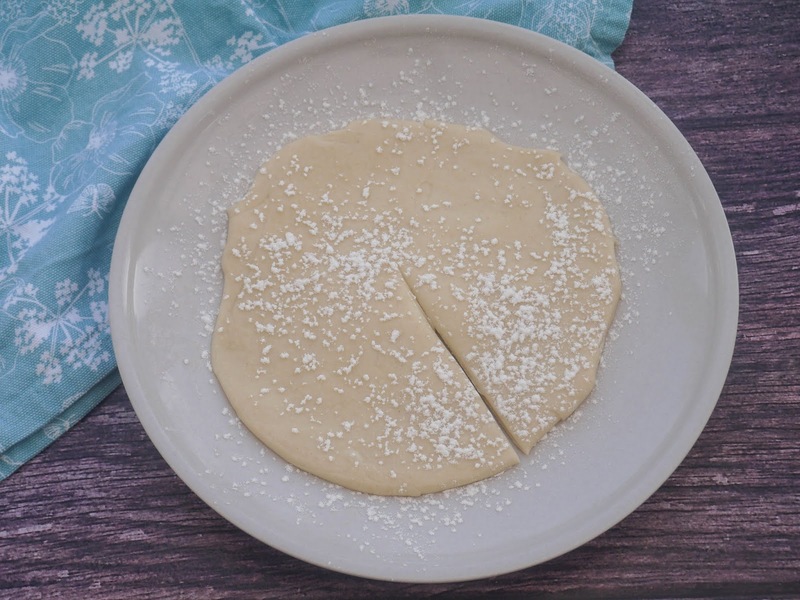 Set aside until needed but keep it warm as that is when it's tastiest. 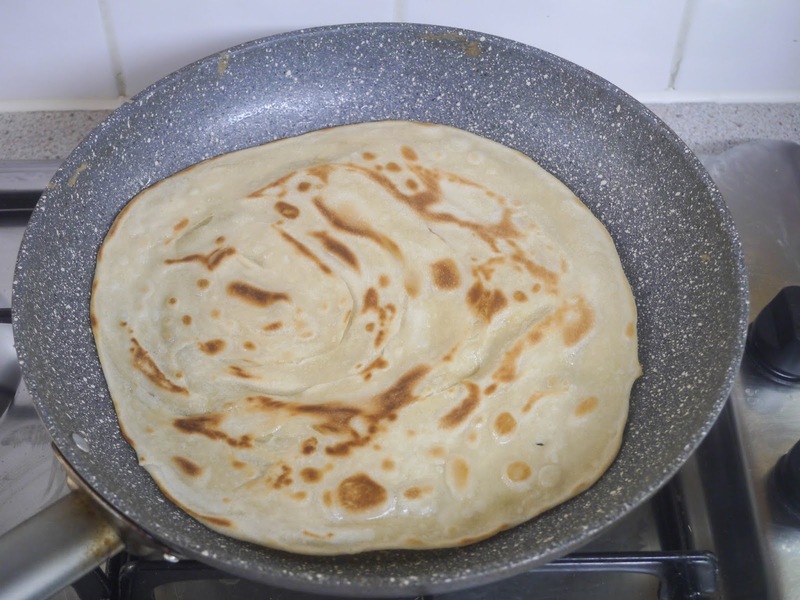 Next, let's cook the parathas. Roll each dough ball to about 22cm round with an oiled rolling pin. Heat a large frying pan over a medium heat with 3 tablespoons Vegetable Oil. 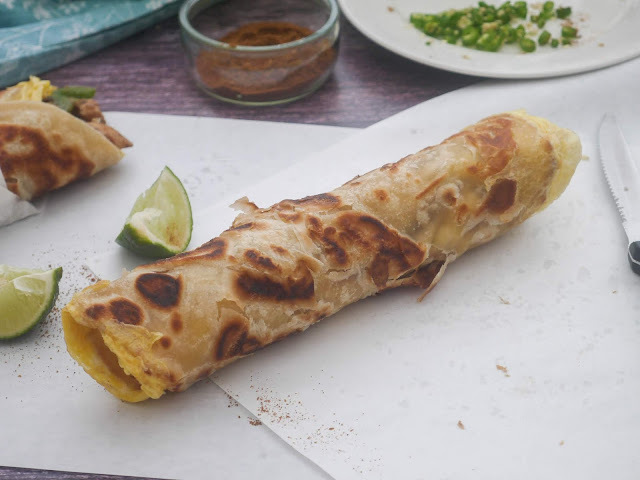 When the oil is hot, add in the rolled paratha. 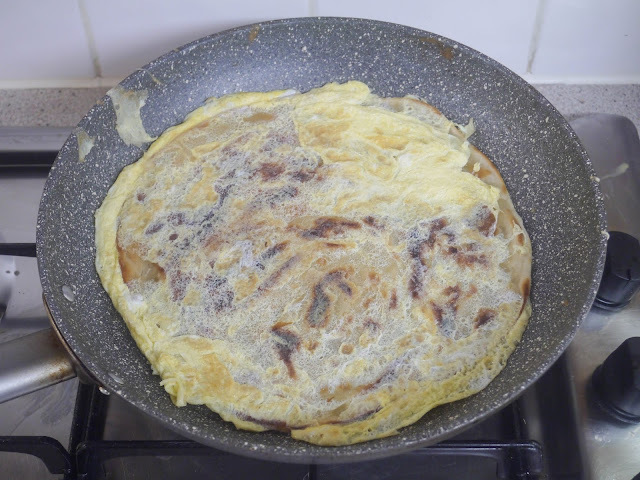 Cook until the paratha is golden brown on both sides, flipping occasionally. 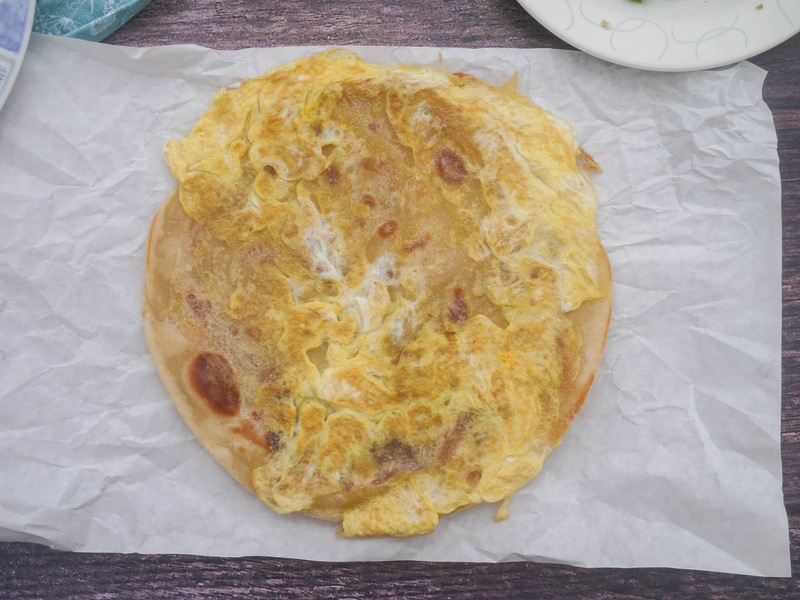 The parathas are delicious as they are but we like them with an egg. This is optional. 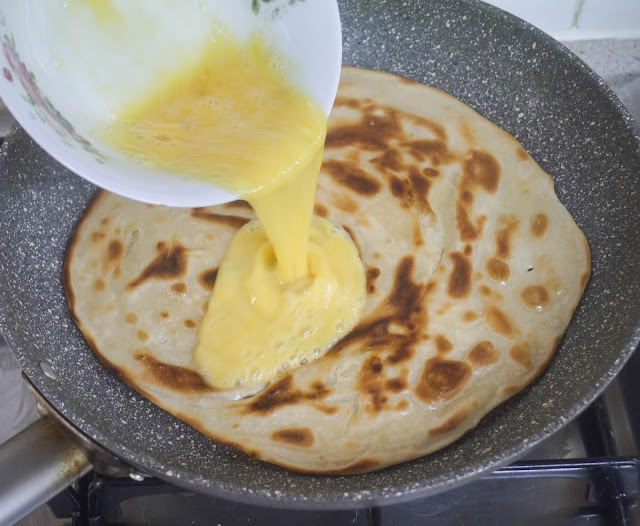 Pour 1 large beaten Egg over the paratha. Carefully flip over and let the egg cook. 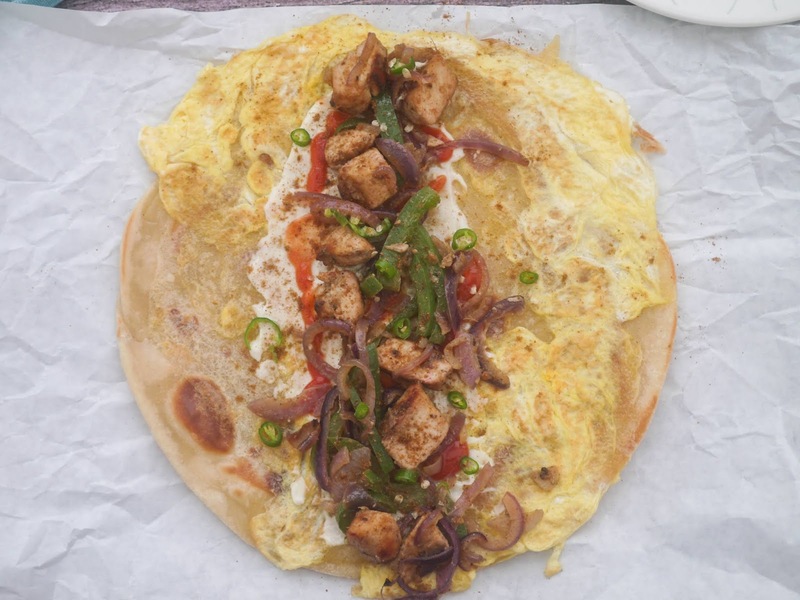 It doesn't have to be perfect as long as the egg is cooked. 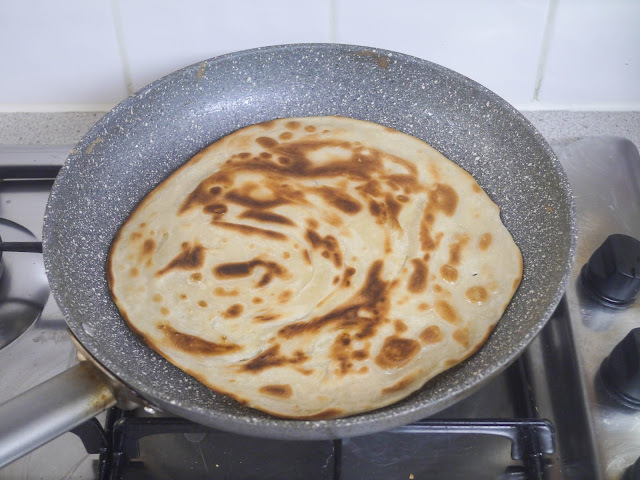 Remove from the pan and continue cooking the rest of the parathas. 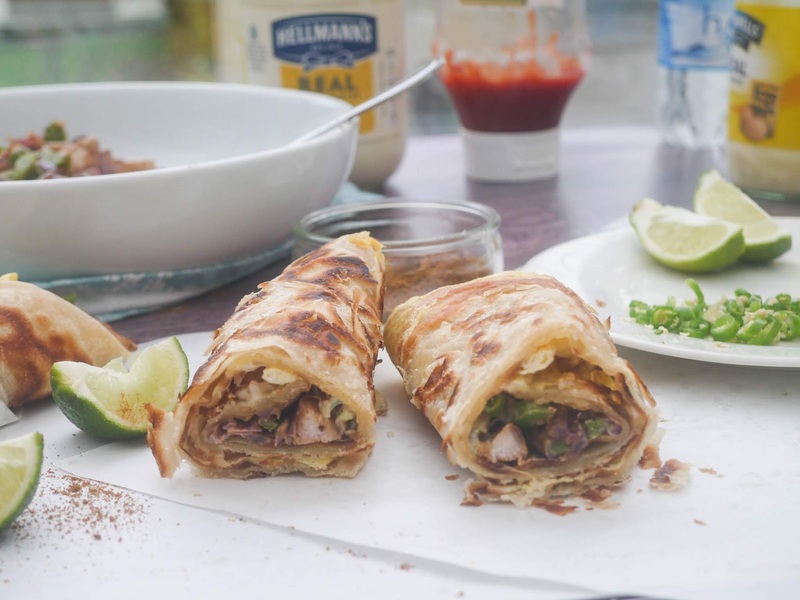 The parathas are best fresh so let's make wraps with them straight away. 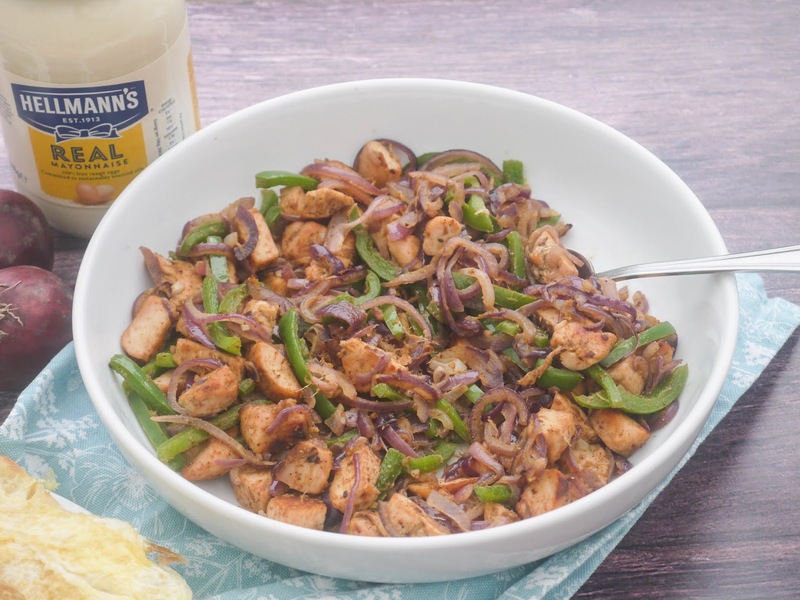 Grab your smoky chicken and peppers. 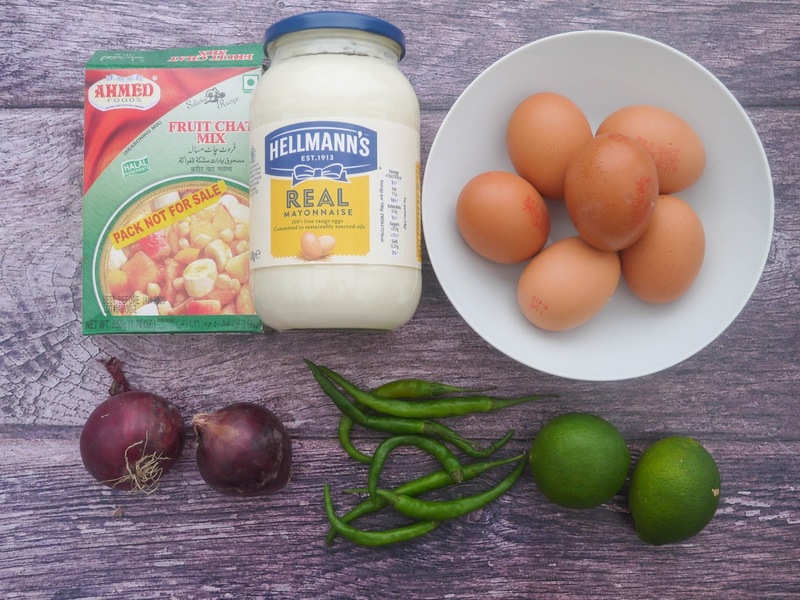 Plus a little Tomato Ketchup and Mayonnaise. 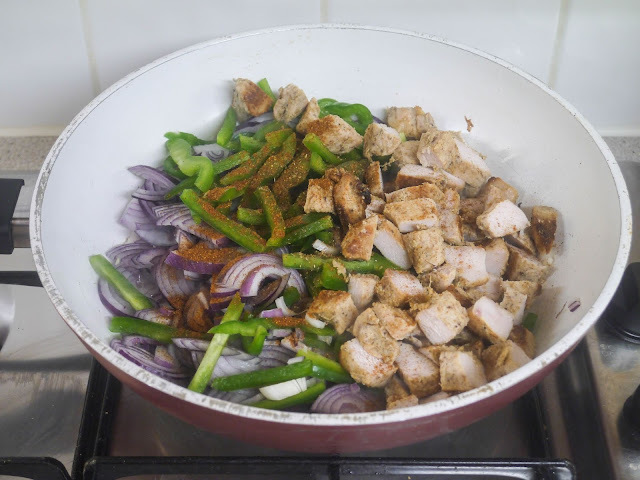 Ooh, and you can also add in sliced Red Onion. I'm not a fan so left them out. 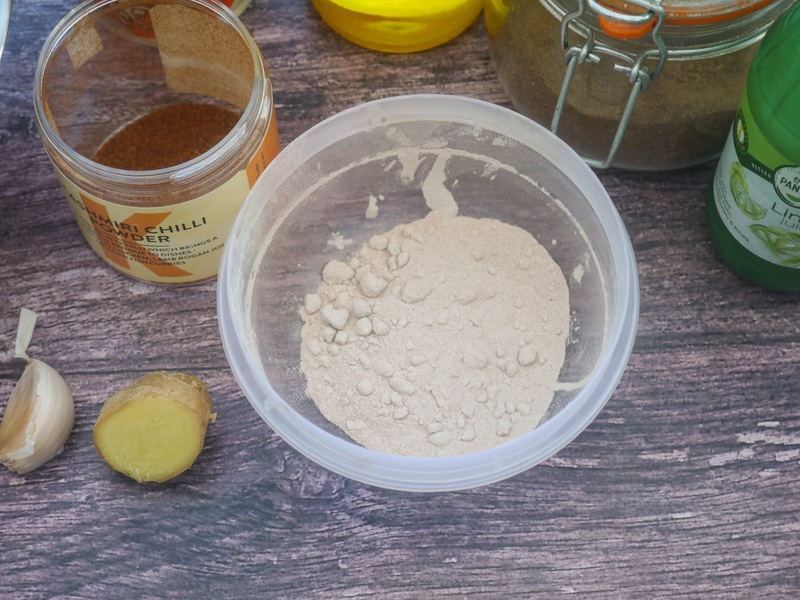 Here's how I made mine. I took an egg paratha. 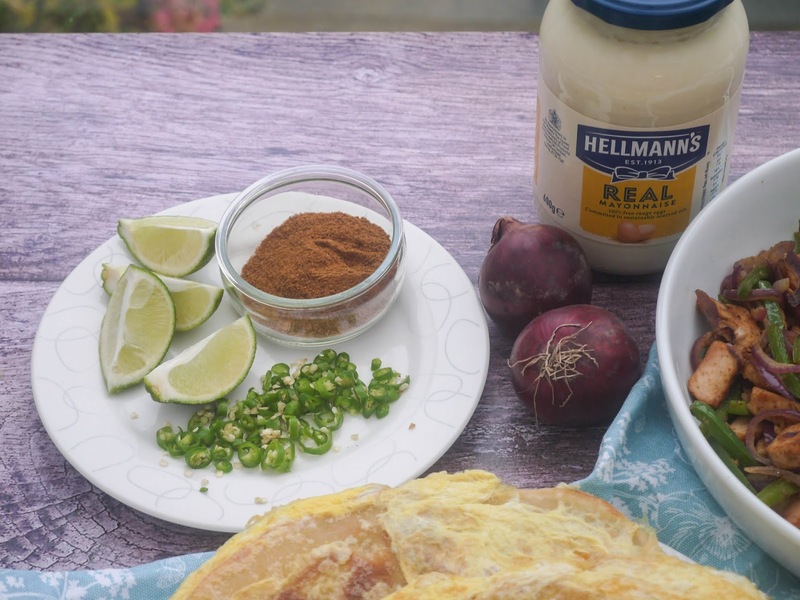 Spread on a little Mayonnaise and Tomato Ketchup. Added a few spoons of the smoky chicken. Sprinkled over sliced green chillies and a squeeze of lime. And, finished with a dusting of chaat masala. The parathas are great on their own but we particularly enjoyed them with the smoky chicken. 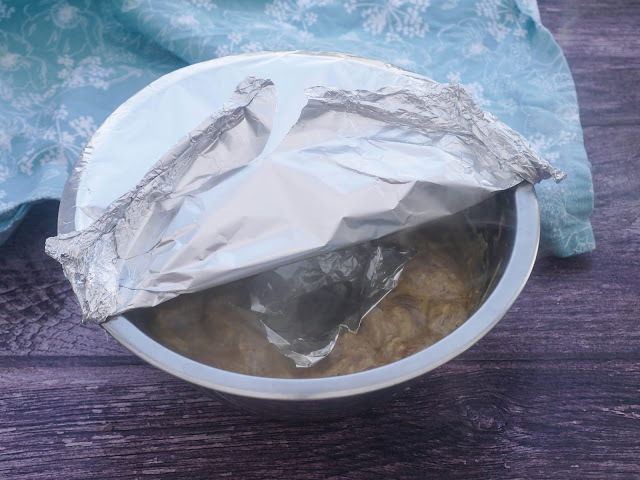 Wrap them up in foil and enjoy on the go! 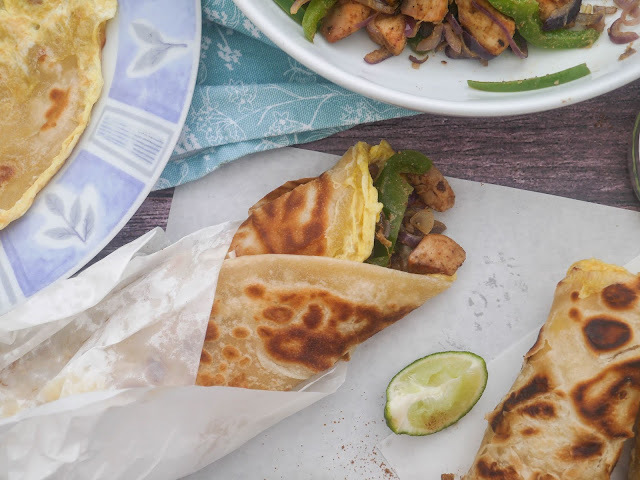 homemade flaky parathas with smoky chicken, green chillies, and plenty of chaat masala. 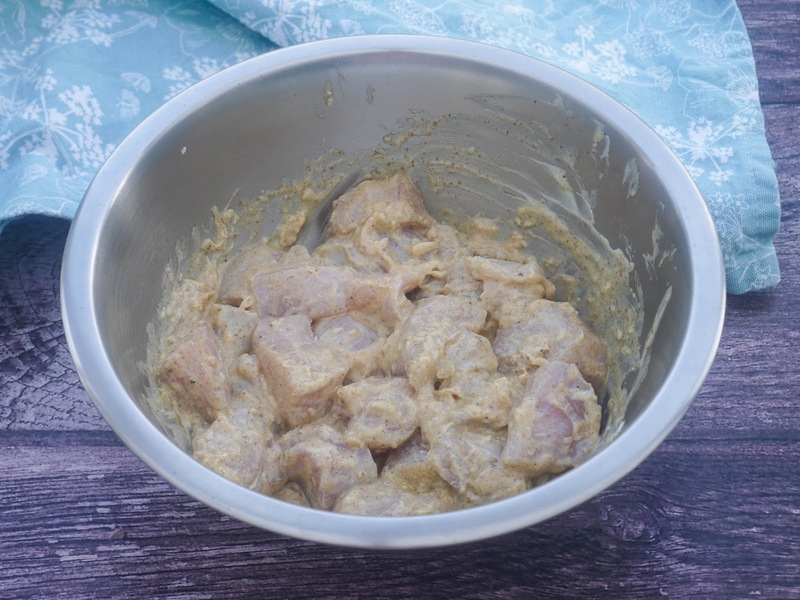 Prep Time: About 30 minutes + extra time to rest and marinade. 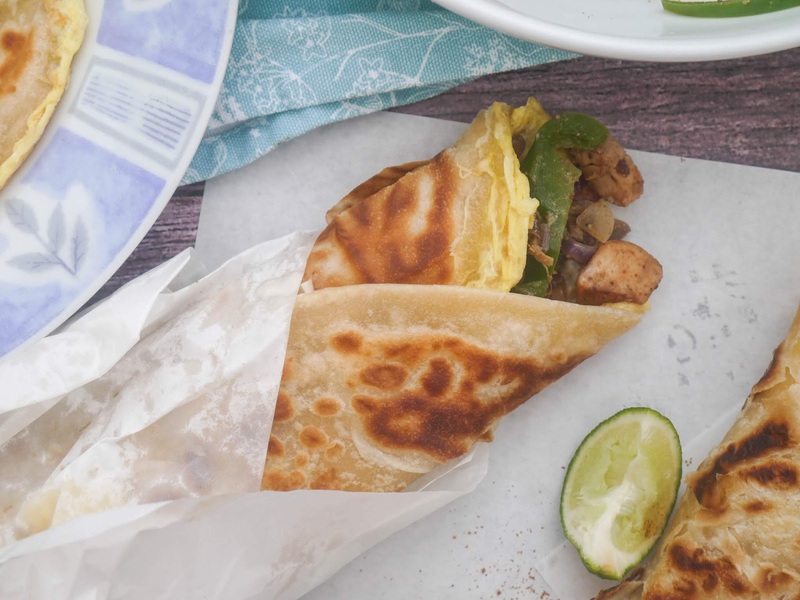 Serves: Makes 6 large wraps. 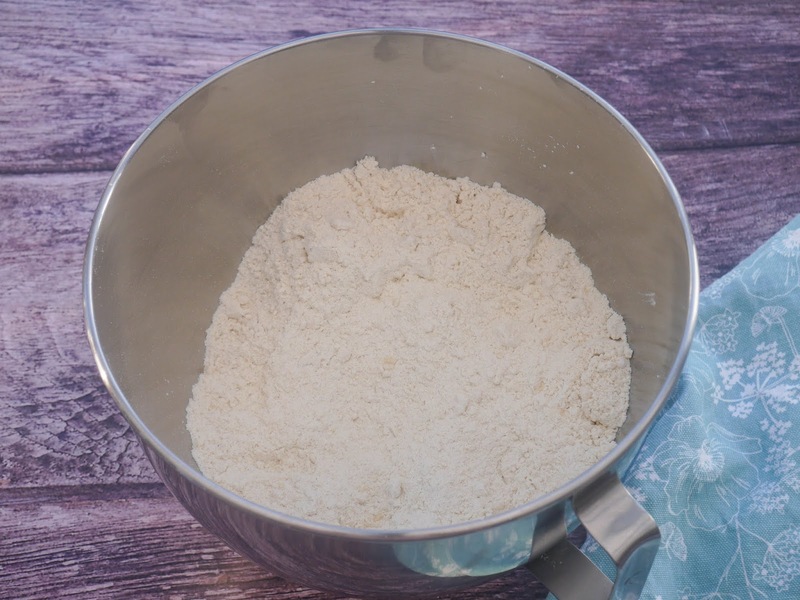 Mix the plain flour, salt, sugar and butter together until the mixture resembles breadcrumbs. 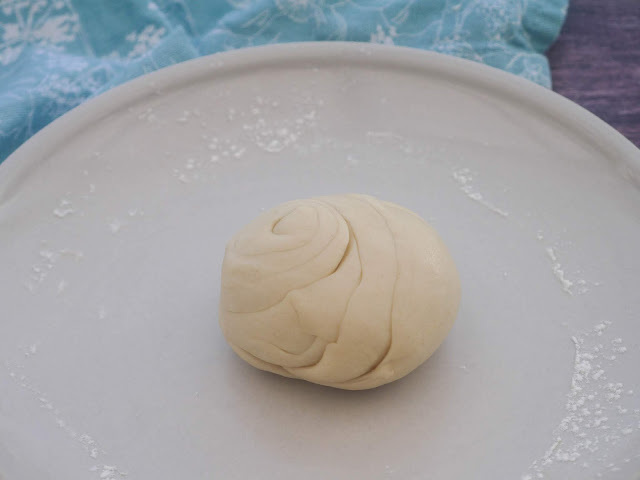 Gradually add the warm water until you have a dough. 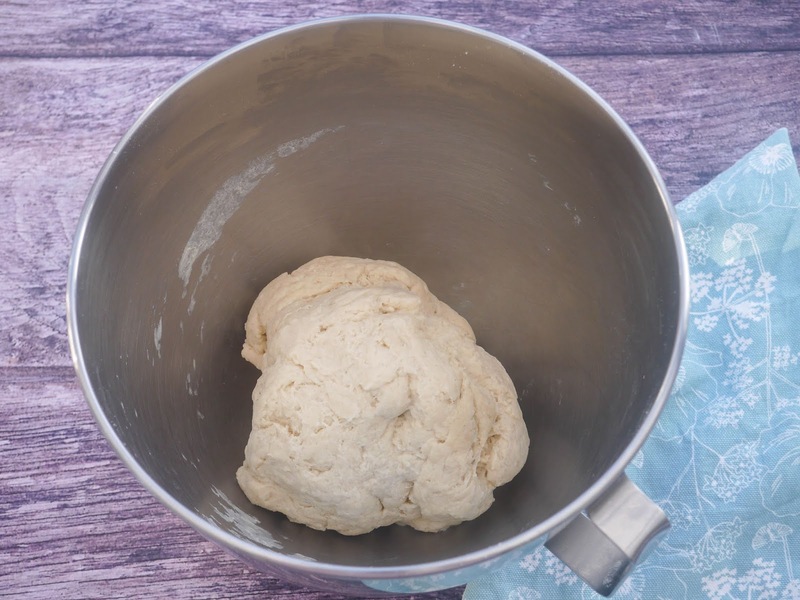 Knead for 5 minutes until the dough is smooth and soft. Put into a lightly oiled bowl and rest for 1 hour. 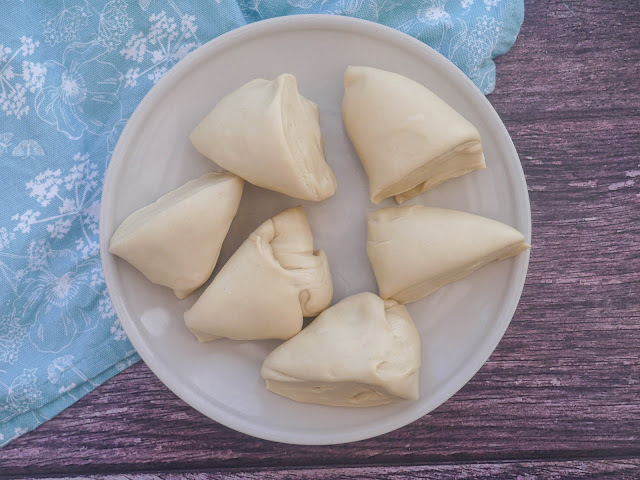 Divide the dough into 6 pieces and place a piece of butter onto each piece. Tuck the butter into the dough and shape each dough piece into a ball. 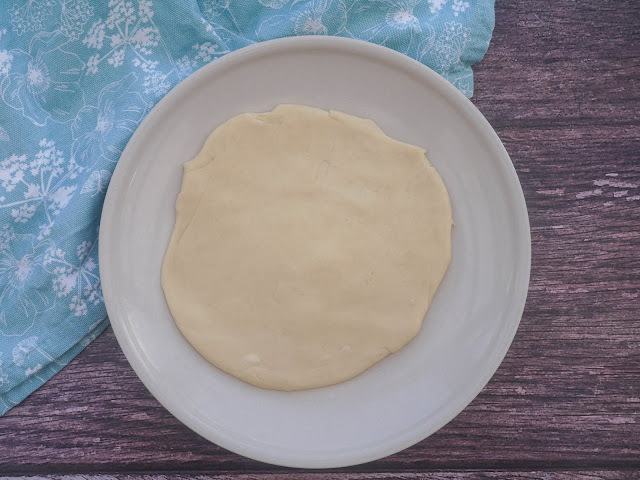 Roll the dough piece out into a small circle. Brush with vegetable oil and sprinkle over plain flour. 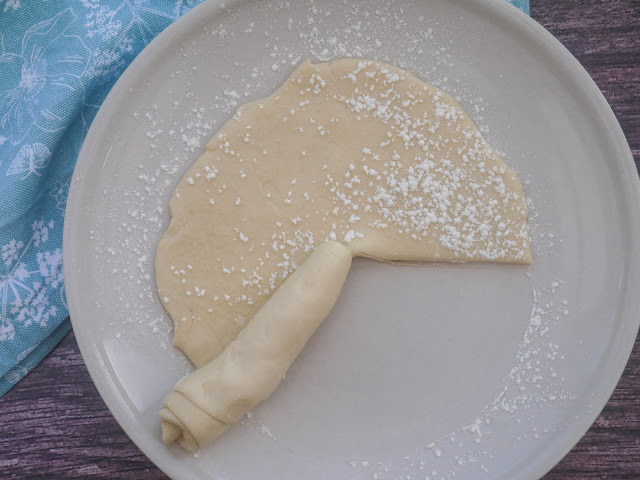 Cut on a radius and roll up into a cone. Press the cone down with the palm of your hand so you have a ball with a swirl. 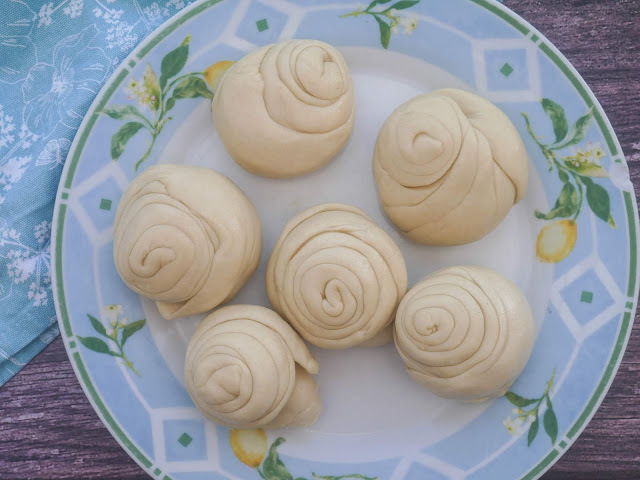 Continue with the rest of the dough pieces. 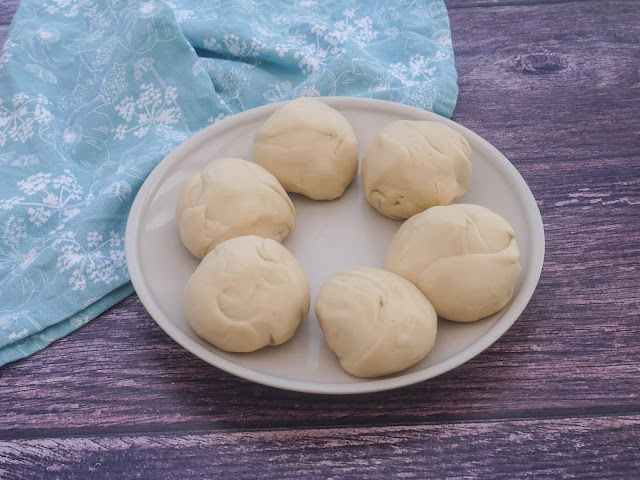 Rest the dough balls for 15 minutes or overnight in the fridge. 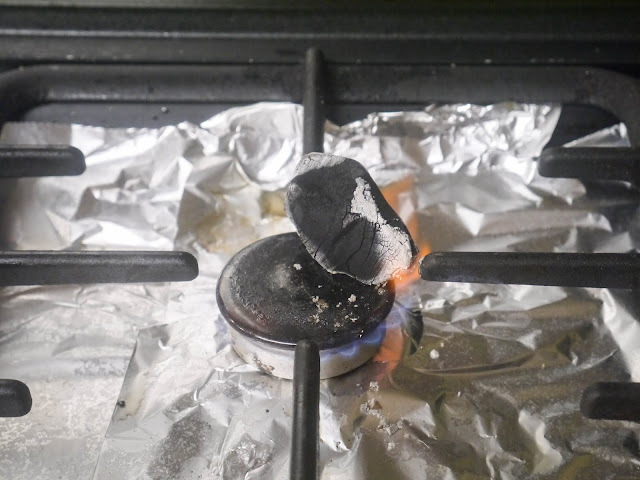 Heat the piece of BBQ coal over a gas flame until it is white all over. 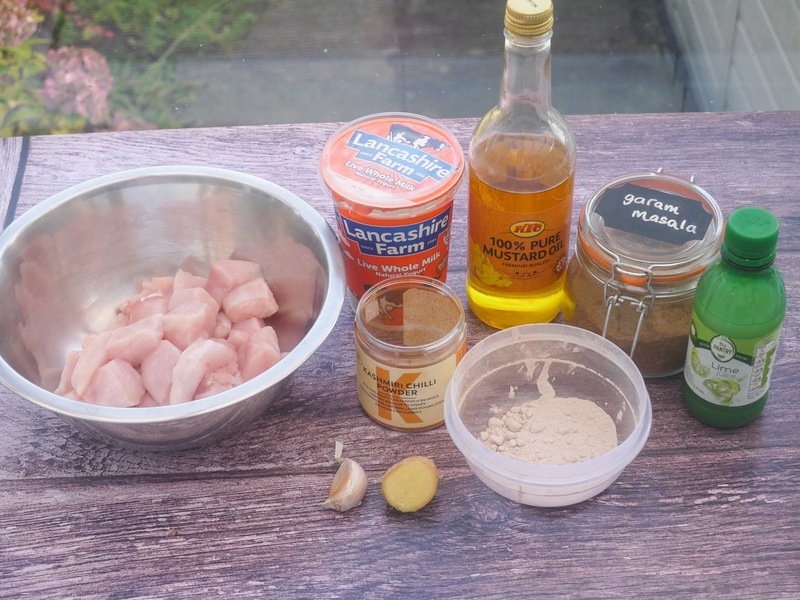 Mix together all the chicken ingredients. 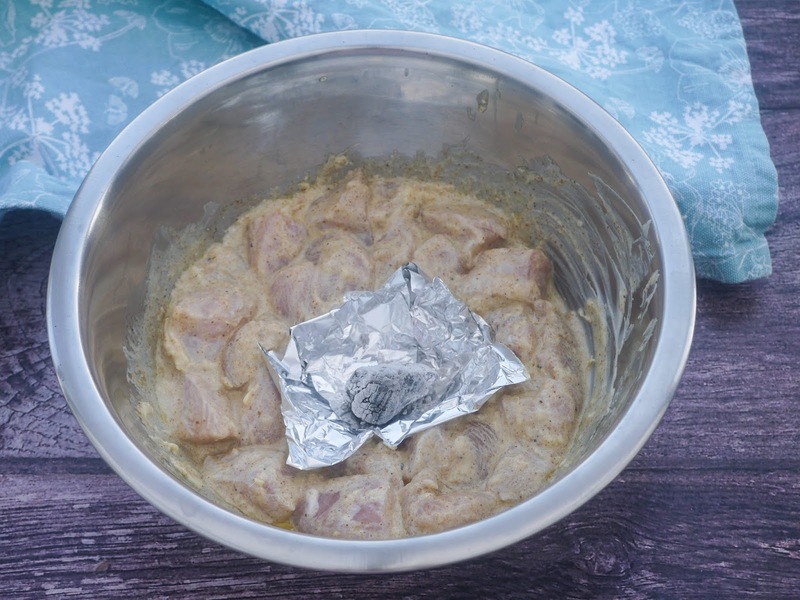 Place a piece of foil in the middle of the bowl and carefully put on the hot coal. Drizzle a little vegetable oil over the hot coal and watch it smoke! Immediately cover the bowl with foil and leave to smoke for 5-10 minutes depending on how smoky you want your chicken. Uncover and remove the coal. 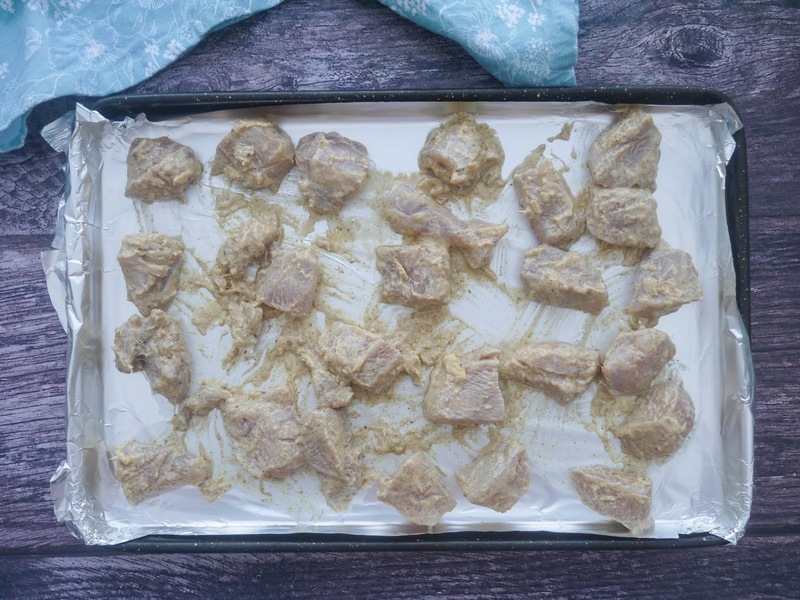 Cover the chicken and marinate for 1 hour. Bake the chicken on a foil-lined baking tray for 15 minutes at Gas Mark 9 or 220C until completely cooked. You may skewer the chicken if you prefer. Heat 2 tablespoons vegetable oil in a large frying pan. Add the chicken, red onions, bell pepper, chilli powder, and garam masala. Stir fry on high heat for 4 minutes. Set aside until needed. 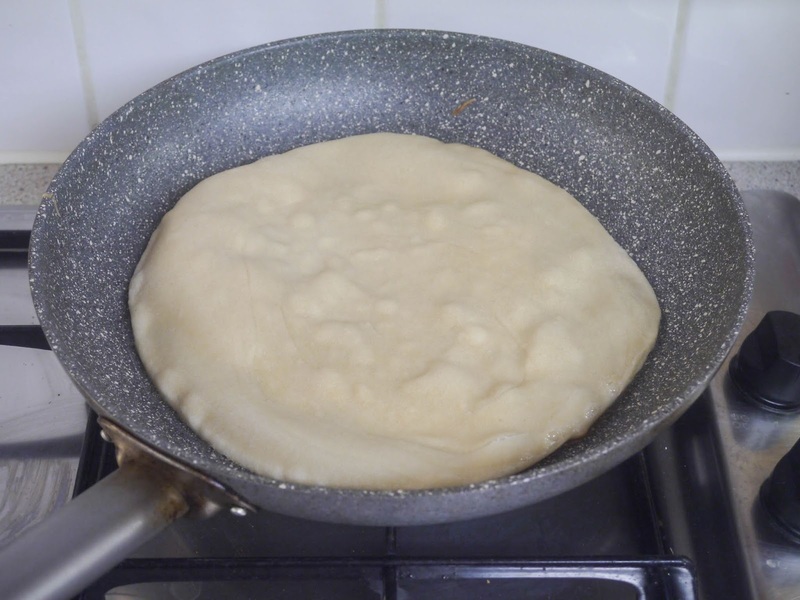 Heat a frying pan with 3 tablespoons vegetable oil over a medium heat. Roll a dough ball to around 22cm round with an oiled rolling pin. 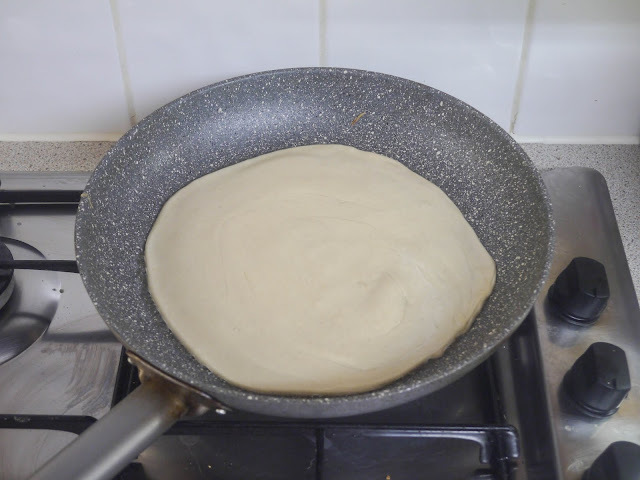 Cook in the hot pan until golden brown on both sides, flipping occasionally. 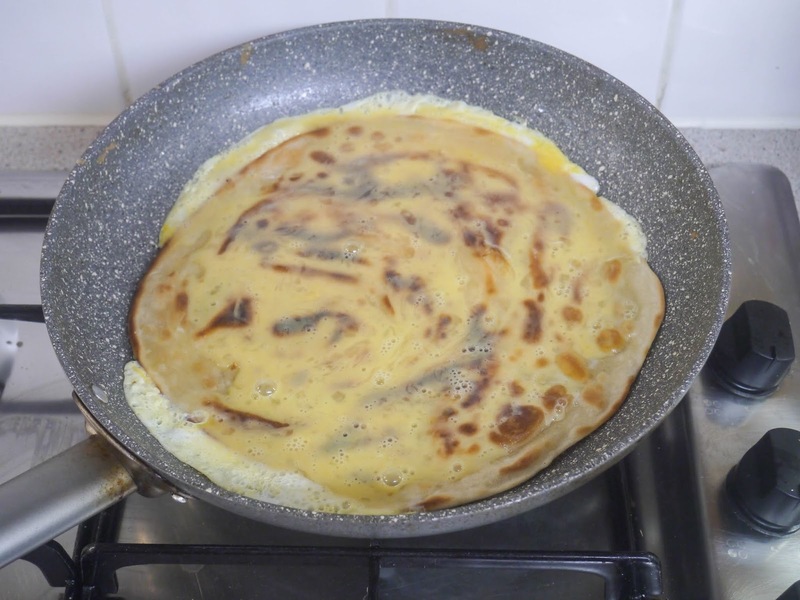 For an egg paratha, beat one egg in a bowl and pour over the paratha in the pan. 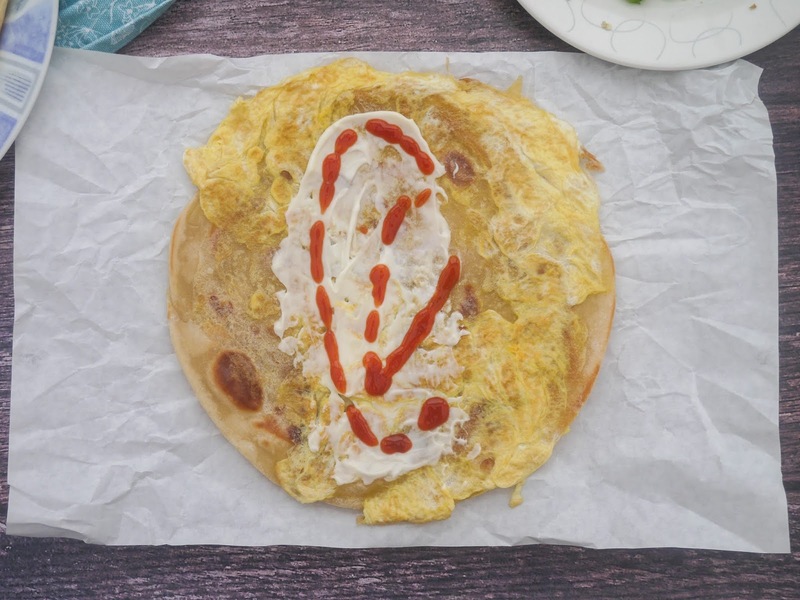 Spread the egg over the paratha and carefully flip and cook with egg-side down. Remove and continue with the rest. 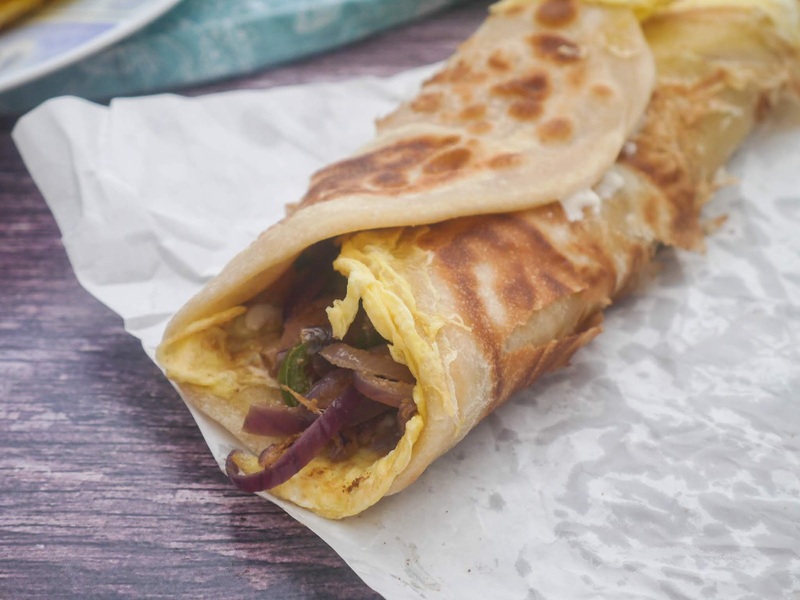 Take a paratha. Spread mayonnaise and tomato ketchup on the egg-side. 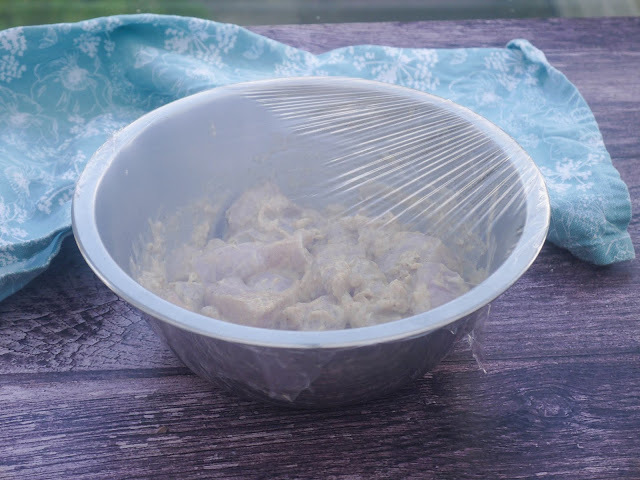 Spoon on the chicken pepper filling. 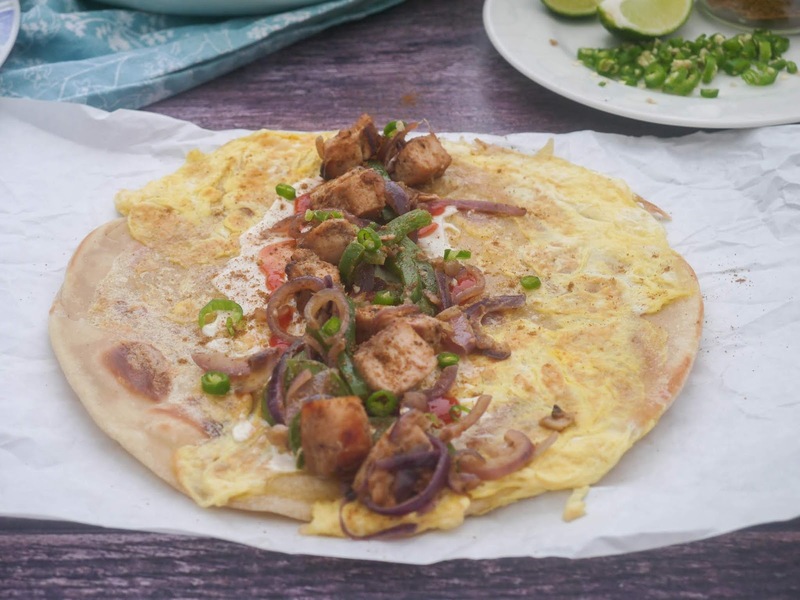 Sprinkle with sliced green chillies, sliced red onions, chaat masala and lime juice. Fold up and eat! 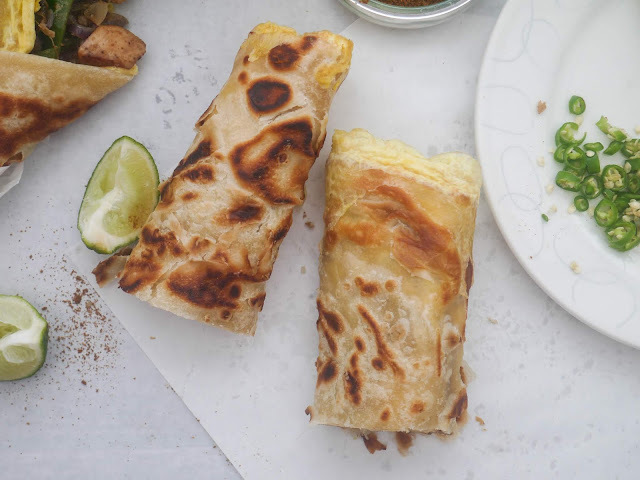 Keep me in your duas please, and enjoy your paratha rolls! 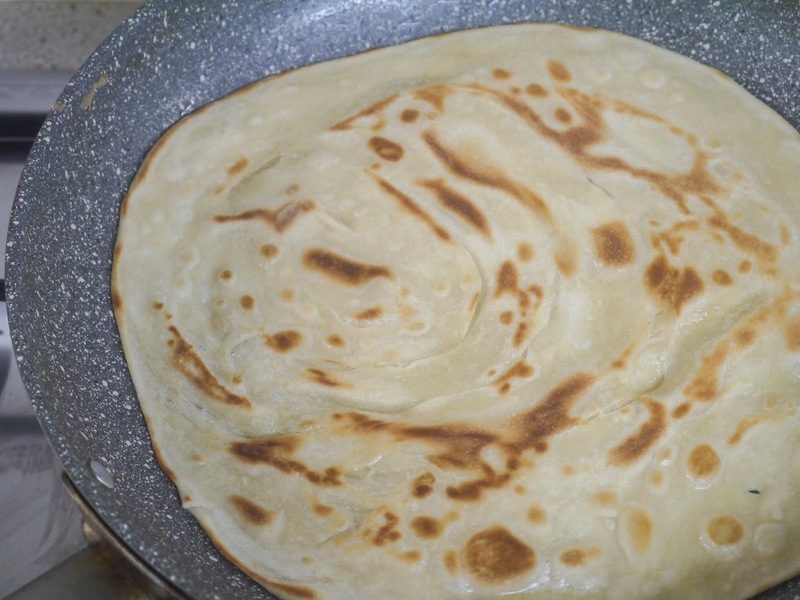 MashaAllah, the parathas look too good��. Hopefully, I will try the smoky chicken. 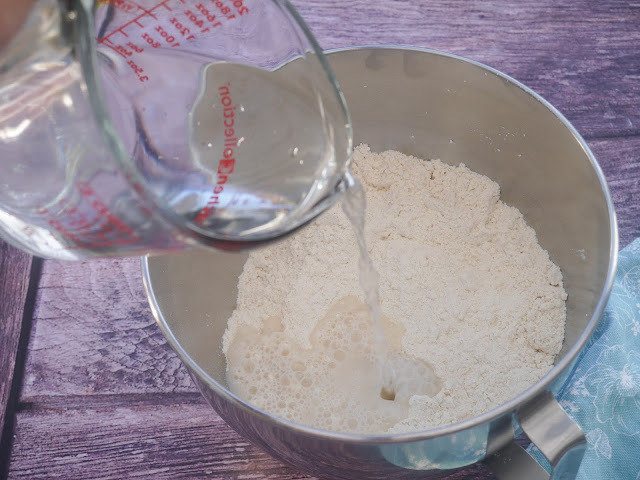 Can the parathas be done without a stand mixer? Could you add specific instructions to knead the dough by hand? Yes, you can just as easily knead the dough by hand. 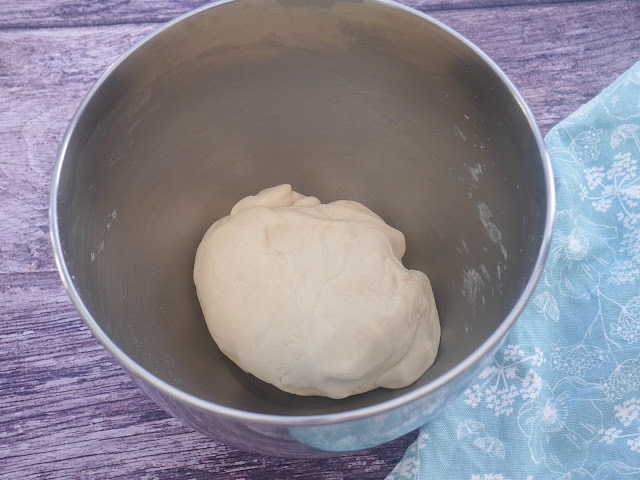 The instructions are the same but you may need to add on more time when kneading to get the dough as smooth as it should be. Maybe around 10 minutes instead of 5. Good luck!